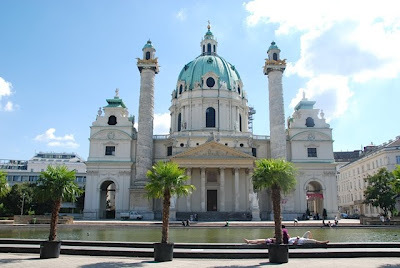 Merisi's Vienna for Beginners: Those Luminous Days Of August! Those Luminous Days Of August! "In 1713, one year after the last great plague epidemic, Charles VI, Holy Roman Emperor, pledged to build a church for his namesake patron saint, Charles Borromeo, who was revered as a healer for plague sufferers. An architectural competition was announced, in which Johann Bernhard Fischer von Erlach prevailed over, among others, Ferdinando Galli-Bibiena and Johann Lukas von Hildebrandt. Construction began in 1716 under the supervision of Anton Erhard Martinelli. After J. B. Fischer's death in 1723, his son, Joseph Emanuel Fischer von Erlach, completed the construction in 1737 using partially altered plans. 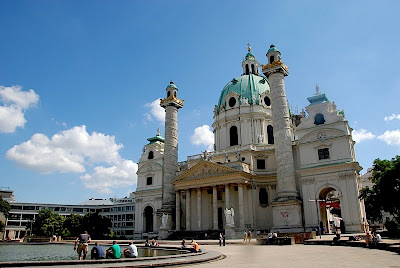 The church originally possessed a direct line of sight to the Hofburg and was also, until 1918, the imperial patron parish church." Striking photo's. I blue sky looks so gorgeous in the church shots. Love how you expanded the story through the pictures. Napping with the angels...priceless, Merisi. I need a nap anyway, but what beautiful repose! I had no idea that palm trees grew in Vienna. I would have guessed that last picture was from Mexico! Your blog is so beautiful.. My friend and I were in Vienna last year. We could only stay a week so we didn't see any of this... We want to go back someday soon and go to all the places you photograph. The church, in contrast to the modern building beside it is very striking. The angels are beautiful. What a dream that must be, it must feel like living in poetry. Wow what a beautiful views.. I love the architecture of old churches. Wonderful! What a fabulous church! So symmetrical. Do you go out every day on a "photo walk"? The architecture of the church is quite remarkable. When was it built? I dream of never leaving them out of sight! I was extremely tired when I walked from the Opera across the wide church square and even though I should have hurried on, I could not resist, I had to capture the moment. I love it when I observe tourists caught in the beauty of the moment. and from what I have read, their presence here goes back a long time. The fact that they need to be ferried to warmer winter quarters indoors seems not to be a deterrent at all. I love them! One of the many things I love about Vienna, is the fact that one encounters so much beauty on a daily basis. Often there's so much to see, I never tire to walk the same streets again and again, sometimes looking up opens whole new perspectives! the modern building to the left is the Wien Museum (Museum of Vienna) - I would like to understand what the architect of thought of the splendid neighboring church - I better not say what I think. 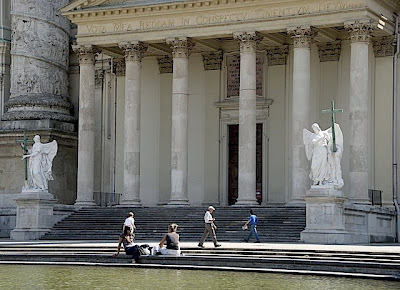 The other side of the church is framed by the Technical University of Vienna and in my opinion a respectful neighbour. 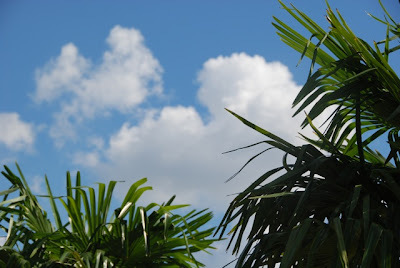 I try not to lose that feeling of poetry (thank you for that line, it reflects what I often think when walking around)! your name lets me assume that you live in quite a splendid place yourself! and the reflecting pool adds to the allure. there are days on end when I do not manage to even sneak one picture. I get depressed after a few days, seriously, and do things like getting up two hours earlier than I have to, just to make sure I finally get to walk around a bit again. I am addicted to this city's streets, and its people too. No place is perfect, but people here manage to eek a bit more out of what they have, in my opinion, thanks to their way of seeing life. the church was built between 1716 and 1737. I added a bit about those years to the original post, with a link for anybody who would like to know more about it.